As Summer comes to a close this Sunday, let us cherish the beautiful past few months with a tribute breakfast using Summer flavors and ingredients! Here is the recipe for a healthy Summer Scrambled Egg and Smoothie Breakfast - goodbye, Summer! Crack the whole egg in a mixing bowl; add in the egg whites and plain Greek yogurt. Whisk the eggs and yogurt together until they reach a nice, smooth consistency. Toss in the chopped spinach and red onion. Season with paprika, salt, pepper, and garlic to your taste - if you prefer one ingredient over another, go hog-wild and add more of it! Mix the eggs, spinach, onion, and spices together until everything is spread evenly throughout. Coat a frying pan with enough butter/olive oil/cooking spray to cover the entire pan and heat on medium heat. Once the frying pan is hot and ready to go, gingerly spill on the egg mixture and fry, just as you would an omelette. If you used a large amount of spinach (like I did! ), the eggs will probably be too hard to flip like an omelette, but I fried the bottom of the eggs until they were a light, crispy golden-brown, and then scrambled the eggs, giving the eggs a little more texture. Once the scrambled eggs are cooked to your liking, remove from heat and serve! 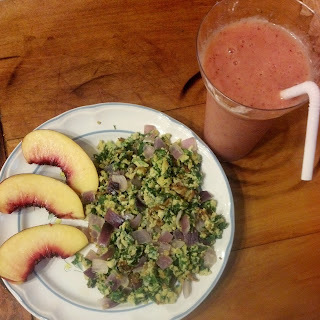 In a blender or magic bullet, blend together the nectarine slices (I saved a few slices for crunchiness with my scrambled eggs), raspberries, and almond milk. Once the fruits are blended, add in the ice cubes and blend some more! I did this in two steps because although I adore my magic bullet, it could use a little more oomph. The smoothie is all set to sip after everything blends together - incredibly easy, but light, fresh, and tasty!